Continuing with the series, it’s time to look at first base. A disclaimer, that I probably should have disclaimed in the catcher post. The positions are based on FanGraphs position leaderboards, where I assume it lists a player in the position they primarily played last season. It’s why Kyle Farmer wasn’t on the catcher post (he’ll be at third) and why Chase Utley and a few others won’t be on this first base post, despite logging innings there last season. Something to note. I may have messed up a bit of my catcher chart. Those numbers reflected the total numbers from the players listed as catcher. These numbers only include stats from players that were playing first base. If I did this chart the same way, it would have included over 1300 Dodger plate appearances. That cost the Dodgers 4.1 fWAR, but they still led baseball in fWAR from first basemen. However, as I mentioned earlier I’ll still only write in-depth about guys who were primarily first basemen last season. I’ll include their full-season stats. In what I expect will be a trend, the Dodger first basemen rank highly in every stat other than strikeout percentage. As we all predicted headed into the season, Muncy finished in the top-20 in fWAR in 2018 among position players. He did so in 481 plate appearances, joining Anthony Rendon (597) and Aaron Judge (498) as the only top-20 players with fewer than 600 plate appearances. Justin Turner broke his wrist in Spring Training, which eventually opened a door for Muncy to join the team. After 38 minor league plate appearances, Muncy was called up to the majors on April 17. He singled in a pinch-hit appearance in his debut and hit a dong in his first start a day later. He would go on to hit 21 more of those before the All-Star break and competed in the home run derby, where he eliminated Javier Baez in round one before losing to Bryce Harper in the semifinals. Muncy floated around between first, second and third base throughout the year, but settled in at first as the year moved on. He was consistently excellent throughout the year, as his only month with an OPS lower than .800 came in his limited April. Pretty much any way you look at it, Muncy was one of the best hitters in the baseball last season. He didn’t have enough plate appearances to be a qualified hitter, but if you lower that number to 450, Muncy begins appearing on leaderboards. Only four batters higher a higher wRC+, OPS or wOBA than Muncy (Mike Trout, Mookie Betts, Christian Yelich, J.D. Martinez) last season. Being on any sort of list with those four is a pretty solid sign. Of those four, only Yelich had a higher hard-hit percentage than Muncy, who finished ninth overall. Only two batters in baseball (Joey Gallo and Khris Davis) were better at barreling the ball (defined by Statcast here). Arguably the only area where Muncy struggled offensively was with his strikeouts, where he had the 14th-worst K% out of hitters with 450 plate appearances last season. The Dodgers aren’t shy about platooning players, and Muncy was platooned down the stretch. While he had significant lefty/righty splits, he was still a solid option against lefties with a .255/.361/.529 triple slash. That didn’t stop him from being platooned at times, including in Games 1 and 2 of the World Series. Like most Dodger hitters, Muncy struggled throughout most of the postseason. He did most of his damage in the NLDS, as two of his three postseason dongs and four of the six runs he drove in came against the Braves. He did provide the Dodgers with one of the two good moments of the World Series, as he homered in the bottom of the 18th inning of Game 3 to give the Dodgers their first (and only) win of the series. Muncy played in every game of the postseason, coming off the bench in six of the 16 games. He only had two playoff games where he didn’t strike out, and struck out at least once in each of the final 10 games. By the time Turner returned, Muncy’s bat was needed in the Dodger lineup. Bellinger’s versatility allowed him to move to the outfield to keep both in the lineup, and as it stands now Bellinger will likely remain there in 2019. Coming off a season during which he won NL Rookie of the Year, 2018 seemed to be a disappointing season for Bellinger. His 39 dong season in 2017 seemed to be unsustainable, as his HR/FB rate fell 10 percent to 15.2 percent. League-average is around 10 percent, so maybe we should have seen a dip in power coming. Bellinger struck out less frequently in 2018 than he did the season before, but the quality of the contact he made also fell. His “soft hit” rate increased about five percent, while his “medium hit” and “hard hit” rates both dropped. His barrel rate also dropped about four percent after finishing in the top 10 percent of the league in 2017. Bellinger played in 162 of the 163 games for the Dodgers in the regular season, with his only day off coming in June. He also got stronger as the season went on, as he posted an .896 OPS over the last two months of the season. Another trend that I’m sure we’ll find throughout this series, Bellinger performed poorly in the postseason for the second consecutive year. Bellinger appeared in all 16 postseason games, starting in 11 of them. In 57 plate appearances, Bellinger collected six hits and drew six walks while striking out 16 times. His two-run dong in Game 7 of the NLCS was his only homer of the postseason, although it was a big one. While Bellinger is one of the better defensive first basemen in the game, it remains to be seen how much first he’ll play this season. He played a pretty good center field for a good chunk of last season, and is definitely athletic enough to handle either corner outfield position. Those stats are a bit misleading, as they were in 47 plate appearances. Freese began the year in Pittsburgh and was acquired by the Dodgers at the waiver deadline in August. While his overall numbers weren’t as wild as his numbers with the Dodgers, Freese quietly put together an excellent season in 2017. While Freese was used more sparingly last season than he had since 2011, the 35-year-old put up the best numbers he’s put up since 2012. His OPS (.830) and wRC+ (126) were both the highest he’s has since 2012, and he put up more fWAR than he did in the past two seasons despite having nearly 200 fewer plate appearances than he did in either of those years. Freese was acquired primarily to hit lefties, which he did all season at a very good rate. In 155 plate appearances against lefties, Freese posted a .321/.387/.489 triple slash. 33 of his 47 Dodger plate appearances came against lefties, and Freese posted a 1.331 OPS. He had a ridiculous .688 BABIP in those plate appearances, but Freese was acquired to be hell on lefties and for that month, he was just that. With the Dodgers platoon-heavy approach, Freese ended up starting 10 games in the postseason. He was one of the few Dodgers that didn’t forget how to hit, as he posted a .364/.423/.773 triple slash in those 26 plate appearances. Of his eight postseason hits, four went for extra bases. Dave Roberts caught a lot of heat for his postseason decision-making, and the only one I truly didn’t understand was why Freese was so often pulled from games early. Freese didn’t complete any of the 10 games he started and was pulled from those games before the fifth inning four times. He only had more than two plate appearances in a game in two of the 11 games prior to the World Series. Five other players logged innings at first base last year, but will be written about at other positions. Yasmani Grandal was written about at catcher. Utley and Logan Forsythe will get their shine at the next position, second base. Farmer will be featured at third, and after omitting him from my catcher post I learned he had a larger fanbase than I anticipated. Enrique Hernandez will be written about in-depth somewhere, likely centerfield, where he played most often last season. He played every position but catcher, including 46 innings at first base. For those 46 innings, Hernandez wore extremely tight pants. It sparked a piece that, somehow, hasn’t received its Pulitzer yet. 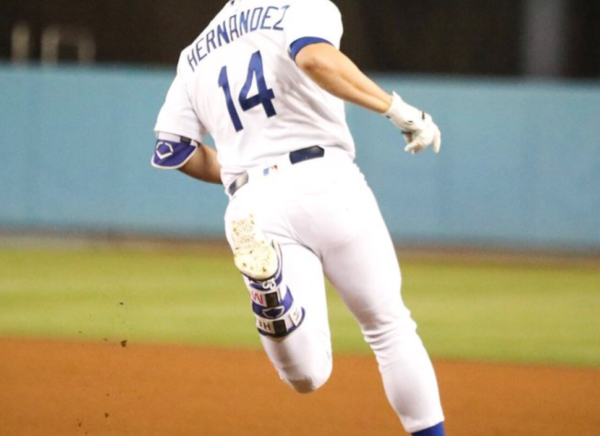 I think I’m supposed to tell you all to click our stuff, but if you click one thing for the rest of your life please click this to learn how the tightness of Hernandez’s pants impacted his performance. On the field. Previous J.T. Realmuto should be a priority for the Dodgers … right?